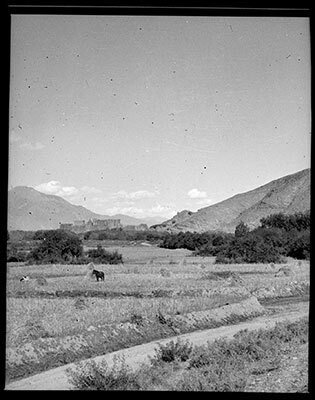 Fields at Chidesho (skyid do shod) with harvested crops, a horse and a cow. There is a large building (Gongkar Dzong?) in the distance and a wide track in the foreground. Manual Catalogues - Notes on negative album - '4 LHOBRAG 1950' 'Gongkar. Dzaring La. Lha khang Dzong. Sras. Pemaling Tso. Ku la kangri.' written in white in Richardson's hand. The Tibet Album. "Fields at Chidesho with Gongkar Dzong? in the back" 05 Dec. 2006. The Pitt Rivers Museum. <http://tibet.prm.ox.ac.uk/photo_2001.59.4.3.1.html>.